Grimes is the premier Central Iowa residential, business, and recreational destination! The average age of the Grimes resident is 33 years; Grimes is a community of young professionals who have chosen to locate here because of its excellent school district, its proximity to Interstates 80 and 35, downtown Des Moines, and the Des Moines International Airport. Roughly 150 new homes per year have recently been built, and infrastructure exists or is under development to accommodate over 500 more. Abundant land, utilities, and infrastructure also abound for business and industry start-up or relocation. Grimes’ leaders see the potential for explosive growth, and have taken steps to invest heavily in projects that will maintain the aesthetic and historical integrity of the community, while expanding modern, unique, and diverse community offerings. Grimes, Iowa, has become, through bold and innovative visioning, wise investments, expert planning, excellent services, and enlightened partnerships, the premiere central Iowa metropolitan destination. Grimes is a statewide leader in diversified residential living and exclusive recreational opportunities, and is home to a wide variety of industrial, commercial, and retail enterprises, making our community Iowa’s best place to live, to work, and to play. Come and visit Grimes today. The future of quality living is here! 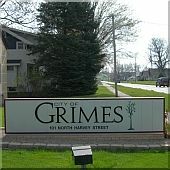 Grimes is the 55th largest city (by population) in the state of Iowa. Grimes is located in the largest county (by population) in the state of Iowa. Grimes is located in two counties: Polk and Dallas. 31.8 percent of all residents over the age of 25 have a bachelor's, graduate or professional degree.